When thinking of a high school classroom, what comes to mind? Perhaps it’s rows of desks all lined up facing the board. The front in spitting distance of the teacher, and the rest with a perfect view of their shaggy haired, greasy headed classmates. For most students, this is a reality we know all too well. Of course, every now and then, we get the joy of having a class with a reading nook. It might have a couch or a couple of bean bags. Naturally, these spots get taken by the few kids who sprint to class every day. However, English teacher Catherine Engel has taken the dream of many students and made it into a beautiful reality. When you first reach the door to her room, you can already smell the scent of freshly brewed coffee wafting into the hallway. You walk into the lamp lit classroom, and it feels warm and welcoming. The walls are covered with personality: photos of family, a huge Michigan State flag. As you walk across the intricately designed rugs and pass the few tables with cushy office chairs tucked into them, you settle on the plaid couch near the window. When you sink into the cushions, all your stress dissipates, leaving only you and your work to focus on. Surrounded by a small circle of other couches and single sofas, it’s easy to share your writing and discuss ideas with others. It is a wonderland of tranquility. So how did this paradise come about? 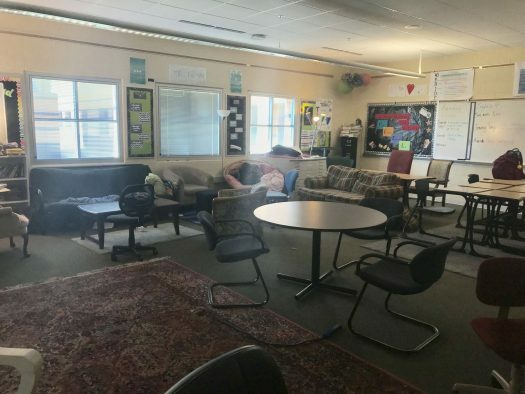 It all started when Engel was scanning through education blogs about classroom environment, and she came across a classroom filled with couches and rugs and armchairs; it looked like a living room. When she saw that, everything clicked. She realized she could do the same thing. Engel started with Donors Choose, an all educator program that allows people to donate to certain projects that educators need funding for. Then, since she wanted to reach as many people as she could, she started a Go Fund Me as well, which does the same thing as Donors Choose, except it’s for everyone, not just educators. She posted her Go Fund Me on all of her social media and soon after got a message from the owner of the gym she goes to. He told her he was interested in making a donation, but he needed something in return: she needed to come to the gym in University of Michigan gear and be recorded working out in it. Now, this may not seem like a huge deal. However, for someone with a Michigan State flag as big as a 12 year old hanging in her classroom, it is a big deal. Of course, it was for her students, and Engel couldn’t even think about refusing. “It’s for the kids; I can get an exorcism later,” said Engel. After going out, buying some Michigan gear (she didn’t own any, of course), and working out like he said, her gym owner donated, not $50, not $100, but instead funded her entire project. Engel was ecstatic. Two weeks later, she went to Ditto and bought about 90% of the furniture she currently has in her room. After calling friends with trucks, she loaded up the furniture and hauled it over to the school. About a month after that, Donors Choose emailed her, saying her project had been fully funded by Burlington, who fully funded four or five teachers’ projects when it moved to Holland. With that money, Engel bought the rugs and office chairs. Of course, money was not the only obstacle Engel had to overcome. There were the administrators that she had to explain her plan to. However, they were really open to the idea of this type of classroom once they saw it. There were desks and tables along with couches and chairs, and they saw it working. They ultimately said to her that, although it was a bit of a risk, the redesigned room was fine as long as it did not hinder student performance. Not surprisingly, students greatly appreciate the changes to Engel’s room. For them, entering the room signifies a break in the day, an opportunity to relax a little as they address the content of the class. “I like that Ms. Engel’s room has cozy lighting. It makes me feel very relaxed and welcomed,” Sr. Louisa Hall said. Students also appreciate having options beyond which rock-hard chair to select. “There’s always a comfy place,” Soph. Zachary Shoemaker said. It’s been so popular and successful that West Ottawa now has added flexible learning spaces that are similar to Engel’s room. Today, Engel notices the shift of atmosphere in her classroom. Students are more able to really focus in on their work. All of their stress just melts away when they enter her classroom, and it will continue to do so.